Chord inversions add a richness to a chord progression and are a great tool for composers to use. I am going to show how easy chord inversions are to understand and give you a few examples of when you should try to use them in your songs/pieces. Chord inversions are really easy to understand! Think of a triad – it has 3 notes. 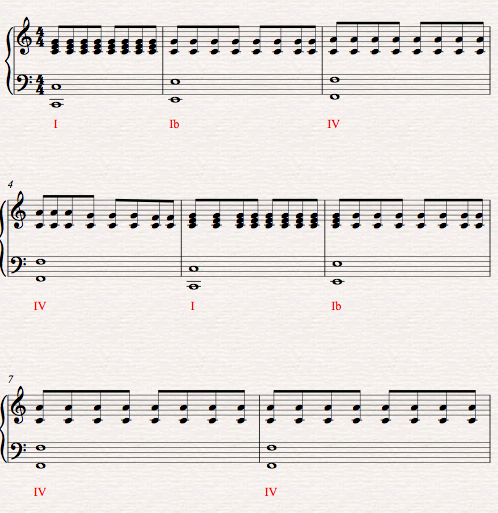 The bottom note is called the root note, the middle note is called the 3rd and the top note is called the 5th. If you play a triad with the notes in this order then it is in Root Position. Now, let’s play the triad again, but this time we are going to move the root note to the top of the triad. The 3rd is now at the bottom of the triad. This is called First Inversion. Let’s play the triad one last time, but this time we are going to move the 3rd to the top. The 5th is now at the bottom of the triad. This is called Second Inversion. There is another inversion called a 3rd inversion. This happens when you are using a 4-note chord such as a seventh chord. If you put the 7th note at the bottom of the chord then this is in Third Inversion. How are chord inversions written? In the Roman numeral system of writing chords a lower case letter is written after the chord to show if it is in an inversion. The letter “b” is used for 1st inversion and the letter “c” is used for 2nd inversion. In popular music you will often see chord symbols like G/B. This says that a G chord should be played with a B at the bottom (a G triad in first inversion). G/D would mean that a G chord should be played with a D at the bottom (a G triad in second inversion). When should I use chord inversions? You can start using the 1st and 2nd inversions in your compositions straight away. The key thing I want you to remember is that when you play an inversion it will sound like it is leading somewhere. First inversions are a great way of building emotion and leading from one chord to the next. They sound really good if you are moving from chord I to chord IV in your chord progression. Second inversions are fantastic if you want to bring a section of your music (e.g. the chorus) to a strong finish. Good luck trying out chord inversions! In the final lesson on chords we are going to look at arpeggios.